After five years of absence progressive cult band The Flower Kings will release their new studio album on the 18th of June. The new sound carrier is called “Banks Of Eden”. 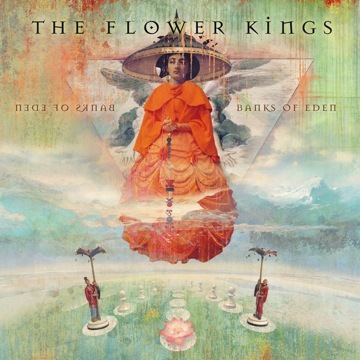 The material is all classic Flower Kings, but the 2012 incarnation of the band mixes it up with both psychedelic and darker metal passages that place this album somewhere in between the late 60’s proto prog and the new generation of symphonic art rock. “It was both a scary and exciting prospect to go back into the studio with TFK after almost 5 years on ice. We have all been active with Transatlantic, Karmakanic, HFMC, Agents Of Mercy since, so we were up to speed in the playing department, but starting TFK again put some weight on my shoulders I suppose, but it’s fun. Realizing that, now with ELP, Crimson, Genesis, Gentle Giant, Pink Floyd being history as far as new records and live shows, we are among the new eldermen of Prog and we feel responsible for keeping the standard up, so a lot of hard work is gonna go into the coming months to prove we’re at the top of our game. With all core members onboard for this re-starting of TFK we brought in new 26 year old drummer prodigy Felix Lehrmann who we feel is gonna breathe life into both the new and old material in a live setting, possibly with a more hard hitting edge. The band will go on an extended headlining tour across Europe in September. But their first official re-union gig is at the Sweden Rock Festival June 8th. and then one month later – 7th July at Loreley “Night Of Prog” where the new album material will be premiered.